I really can't believe this is my FIRST food-related blog post! It's nuts because I love to eat and I love cooking even more. For those that follow me on Instagram, it's pretty common for me to share on IG stories my process for cooking a myriad of dishes; I've been doing this for a well over a year. It's even more nutty that when I meet up with people in person (you know, folks do that every now and again), they mention my food stories on Instagram! It blows my mind every single time because I didn't realize it would be something folks look to expect from me. I share my cooking because I like doing it, not because I'm trying to get views or anything of the sort. At any rate, I was encouraged recently to "do something with my cooking." Lol! The suggestion was actually a culinary class (and I certainly want to do that), but I've had this food section on kikospeaks for the longest and have done nothing with it. I want to change that. Right now, I'm not sure what this section should look like. Will I share all of my recipes on here? Will I do cooking challenges? Will I share thought pieces about Black millennials and food? Idk. To start, I think I'll just share some recipes. I cook more than I share on social media; maybe I can get more in depth about the processes in this space. As I was prepping for this post, I started thinking about at least two other dishes this week I could have shared -- chicken and brown rice and bean soup with smoked turkey necks. Ahh well, gotta start somewhere, right? Welp. Let's start with a classic midwestern (or really any region) meal: steak and potatoes. I come across A LOT of food blogs and I've found that there's so much up front information! This is extremely annoying when I just need to get to the recipe/process. I don't want to waste time with a lengthy back story because...who has time? You came here to read about how I make this simple dish and see what the photos look like. So let's get into it. There are a couple things about me you'll learn quickly, when it comes to food. 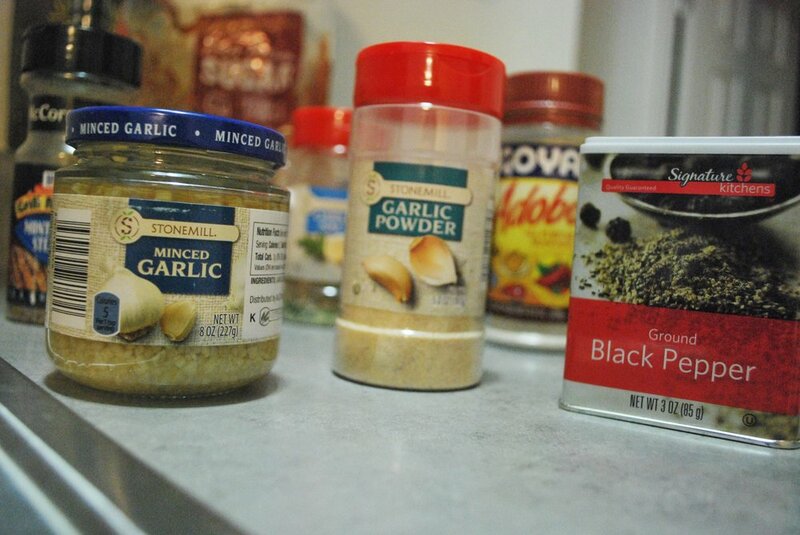 I LOVE garlic and Adobo All Purpose Seasoning in Hot; I put these two gems on almost EVERYTHING I PREPARE. Along with garlic salt. Those three are my gems and I won't apologize for it. When it comes to beef and poultry, I'm also happy to add some brown sugar to the marinade. I have a thing for that savory taste, you really can't beat it. The stars of this marinade are definitely the brown sugar and soy sauce; again, savory is my jam. The cut I prepared was a beef top round London broil -- a fancy name for a really inexpensive cut. I mean, they were BOGO free at Jewel's. But to my point earlier, cheaper cuts definitely need to be marinated, preferably overnight. If you can't do overnight, then a smooth 4 hours will have to do. I normally go for either a NY strip steak or a petite sirloin -- the price points are good (for me) and it's just the right amount. However, the deal on the London broil was too good to pass up, but the thickness of this cut was a bit much, about an inch. I suppose that's why some the blogs suggest thinly slicing this to consume. Whatever. I don't follow y'all rules. The next part is simple; add the marinade to a gallon-sized Ziploc bag with the cut and toss in the fridge. While that marinates, you can get the potatoes going...which are super easy. I really like yellow potatoes because they aren't too big and don't take too long to cook. In general, I feel like it takes forever for potatoes to cook -- like, what's happening all that time?! I took about 4 or 5 potatoes, cut them in quarters and added olive oil, garlic salt, pepper, Accent and...you guessed it, Adobo! I'm not going to list measurements for these because you really don't need them, I promise. Just season to taste and eyeball it. You're smart and I'm willing to bet you have really great judgement. I was in the grocery store recently, in the international aisle, and came across these little garlic cubes. Again, flavor. They're only like .59 and you just crumble them and add to whatever you're cooking! One cube is equal to one of the lil' sides of the garlic (not sure of their proper name, SUE ME). I used about two cubes. I also loathe washing dishes, so anytime I can make clean-up simple, I do. Hence, seasoning and cooking the tots in aluminum foil. After everything is coated, feel free to toss those bad boys to the side, grab a glass of wine and occupy yourself til' it's time for the cooking. Alright, a few hours have gone by and it's time to cook that steak. Oh, since it take about 40-45 min for that tots to cook, you should have put them in the oven about 40 min. ago, cooking on 400°. For the beef, I alternate between broiling in the oven and pan-searing. TBH, I feel like the meat is juicer when I sear, but I get more of that char-taste (I sometimes like) when I broil. How I prepare it is definitely an emotional decision; it all depends on what mood I'm in. There's really no science to it. Whatever I'm feeling, that's what I go with. For this meal, I felt like searing. So, I pulled out the cast iron skillet, let it get hot on medium high, then added the steak. The thing with searing is: it requires a lot of manipulation while cooking. You can't just toss it on the stove and walk away. Why? Well, every couple minutes, you have it turn it over. I let it brown just a bit before adding everyone's favorite: BUTTA. With a fork, I smear the butter on both sides of the cut, making sure it's coated nicely. This entire process, of cooking, takes no more than 6-7 min. I like my steaks medium rare, so they don't cook a long time at all. Just every 2 min., make sure you flip it and don't be afraid of the butter. It's also ok to add a lil' bit of the marinade while it's cooking, because...flavor. Around the last minute of searing, I like to add an aromatic herb, like thyme or basil. This time around, I used basil. Why add this? Aromatic herbs are used for their flavorful properties and to provide a savory essence. And that's really it, folks! Once the steak is done, pull out the tots (which I hope you have been keeping warm in the oven) and plate. Cheers! Combine all ingredients, mixing well. Add marinade to steak in a Ziploc bag and refrigerate for 3-8 hours (all depends on what kind of time you got). After some time has passed, remove steak from marinade, sear in a cast iron skillet (or a large, round skillet) until steak is at a temperature you're comfortable with. Major keys: alternate sides every two minutes, coating with butter; add aromatic herb the last minute of searing. Serve hot. Duh. The potatoes are super simple. Coat in your favorite house seasoning, place in aluminum foil and roast for 45 minutes at 400°. Dat's it!